Yes, even through this anime is a short and its episodes are “marshallow” in size, but they are pack full of suggestive innuendos, misunderstandings, workplace sexual harrassment and a genuine feeling of heart. 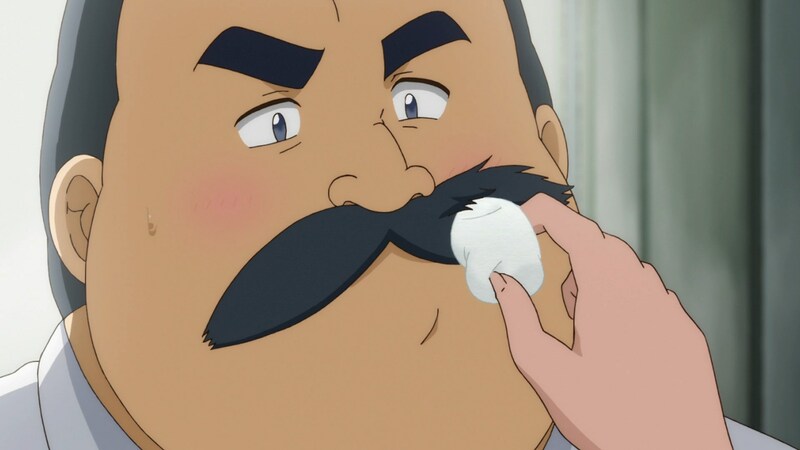 Hige-san is an overweight office worker for a “web-related company” (actual name of it, no joke) and he has an obsession for marshmallows, a trait which is further examined in episode 4. He works along Wakabayashi-kun, a 24 year old female office worker who has a similar obsession with marshmallows, AND Hige-san. Wakabayashi is attracted to Hige and orchestrates several situations in which they can get closer. The punchline is, Hige-san is a very introverted and polite older man, completely oblivious to Wakabayashi’s advances, which creates many hilarious misunderstandings and eventually boils down to the two of them consuming bags of marshmallows. The side characters are few and kinda forgetful. Wakabayashi’s two female work friends turn up in a few episodes and say a few things without really leaving an impact, and Wakabayashi’s brother has only just come into the series recently. But without a doubt, the stand out character in this series so far (apart from the main characters) is the Section Chief. He is hilarious and becomes completely content with the misunderstandings taking place. But you’ll find out more about that when you watch the show. This is such a sweet and innocent story, and at only 3 minutes a piece, they are delightful to binge with only a short amount of time.